Cyber-crime increasingly impacts both the online and offline world, and targeted attacks play a significant role in disrupting services in both. Targeted attacks are those that are aimed at a particular individual, group, or type of site or service. Unlike worms and viruses that usually attack indiscriminately, targeted attacks involve intelligence-gathering and planning to a degree that drastically changes its profile. Individuals, corporations, and even governments are facing new threats from targeted attacks. Targeted Cyber Attacks examines real-world examples of directed attacks and provides insight into what techniques and resources are used to stage these attacks so that you can counter them more effectively. Chapter 7. Why Targeted Cyber Attacks Are Easy to Conduct? Aditya K Sood (Ph.D) is a Lead Architect for Cloud Threat Labs at Elastica. Dr. Sood has research interests in malware automation and analysis, application security, secure software design and cybercrime. He has worked on a number of projects pertaining to penetration testing specializing in product/appliance security, networks, mobile and web applications while serving Fortune 500 clients for IOActive, KPMG and others. He has authored several papers for various magazines and journals including IEEE, Elsevier, CrossTalk, ISACA, Virus Bulletin, Usenix and others. His work has been featured in several media outlets including Associated Press, Fox News, The Register, Guardian, Business Insider, Kaspersky Threatpost, CBC and others. He has been an active speaker at industry conferences and presented at BlackHat, DEFCON, HackInTheBox, RSA, Virus Bulletin, OWASP and many others. Dr. Sood obtained his Phd from Michigan State University in Computer Sciences. 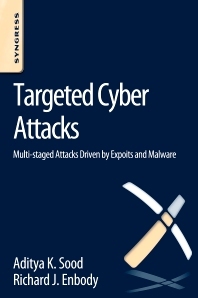 Dr. Sood is also an author of "Targeted Cyber Attacks" book published by Syngress. Aditya K. Sood, Ph.D., senior security researcher and consultant. Richard J. Enbody, Ph.D., associate professor of Computer Science & Engineering at Michigan State University. "Dr. Aditya K Sood and Dr. Richard J Enbody have done an excellent job of taking the very complex subject of targeted attacks and breaking it down systematically so we can understand the attack techniques, tactics and procedures and build defensive mitigation strategies around them. "Targeted Cyber Attacks" provides insights into common indicators of compromise, so your security teams can react as fast as possible and distinguish anomalous behavior from everyday normal user behavior." --Stephan Chenette, CTO at AttackIQ, Inc.